Last month I was contacted by GearBest and asked whether I'd like to do a review of a product from their cycling gear or LED lights categories; I'd get to keep the product in exchange for an unbiased review. Probably they'd seen my headphone review done under similar circumstances. I get this kind of message every so often and don't usually accept, but a bicycle light piqued my interest. 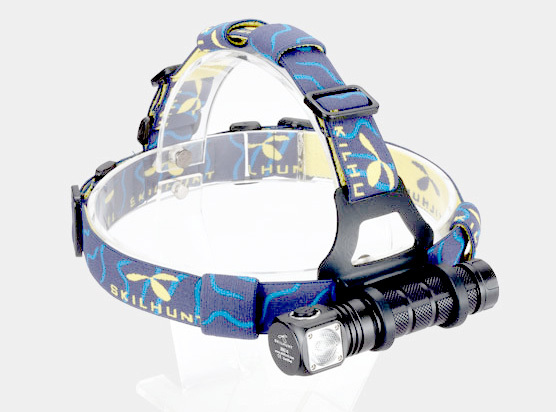 The flashlight easily separates from the bundled blue and yellow headband, so you can use the flashlight around the house or out and about as a normal handheld flashlight. It's quite small... a bit longer than the palm of my hand is wide, and about as thick around as my thumb. 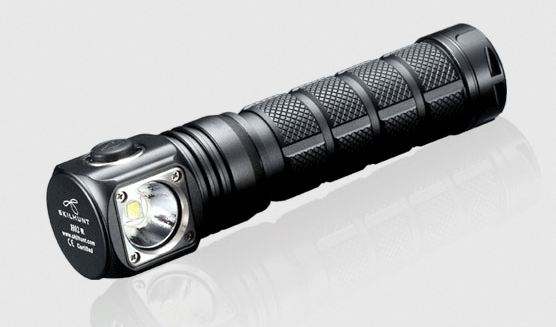 Unlike a traditional flashlight, the beam comes out from the body at a right angle. It is ridiculously bright for its size. The five pictures are all calibrated to the same exposure, and accurately represent the experience in real life. Off shows the darkness without the light. 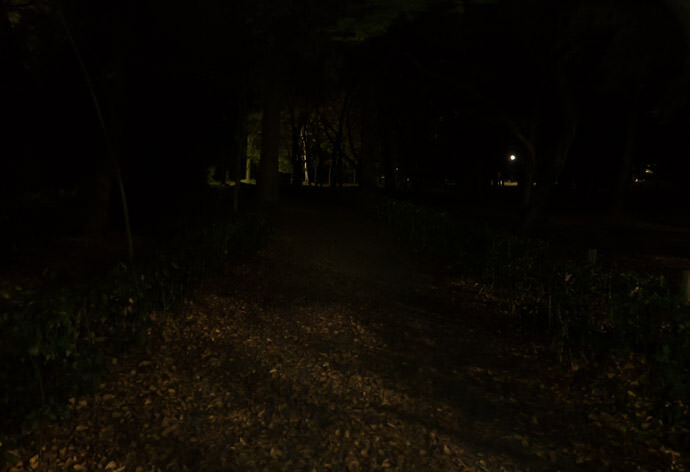 I would not take the chance trying to walk on that path without some kind of light. The low setting (5 lumens), which hardly makes a dent in the scene above, is appropriate for reading or in a tent or other close-in situations where you prefer not to blind yourself. 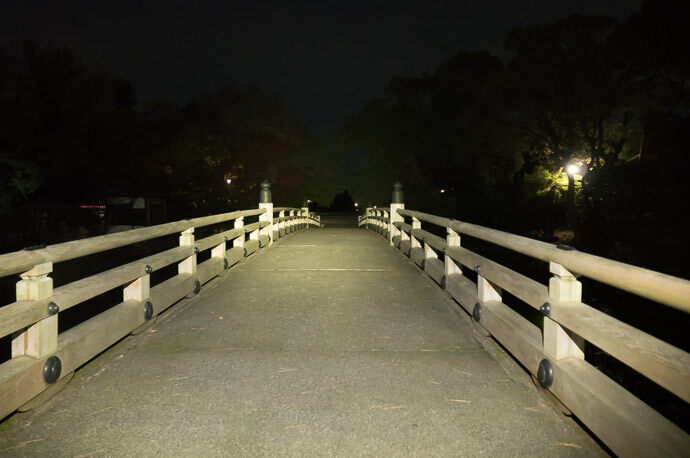 Even at this lowest setting, though, take care not to look directly into the LED, because is bright enough to be physically painful, as my personal testing for this review reveals. “5 lumens” sounds dim to me, but this lowest level is plenty bright even for walking around. The next brightness level, the 120 lumens of “medium”, is probably brighter than any triple-D-cell flashlight I had growing up. It's more than appropriate for walking or, I'm sure, hiking. It's phenomenally astounding to me how bright one tiny little LED can be. Technology is amazing. The final two brightness levels, high and turbo, are just more of the same (400 and 860 lumen respectively), and perhaps are less important for walking or hiking than for search-and-rescue, but as I'll get to in a bit, I think they're important for cycling. Now that I've made the basic introduction, let me make it clear that I'm no expert in lights, cycling, or the combination thereof, so take this review with that grain of salt. This flashlight can take three kinds of battery (one “18650”, two “CR123”, or two “RCR123”), none of which I'd ever heard of before. All seem to be at least not uncommon for use in flashlights. The “18650” is apparently used in Tesla cars. The flashlight didn't come with a battery, so I bought this 3500mAh rechargable “18650” and recharger for about $25. Judging by the limited research I did on Amazon, there's quite a range in power capacity among “18650” batteries. I noticed claimed capacity ranging from 1500 mAh to 4000 mAh. The one I bought had the largest capacity among batteries that didn't look to me like cheap, dangerous rip-offs. With modern batteries, you do not want to take chances with inferior quality. The flashlight is small, and the combined weight of the flashlight, battery, and head-mount band is not appreciable while wearing. I found it a bit more comfortable to wear over a cycling cap than on my bare head. In either case, my helmet fit over top. Even in the limited testing I've done, I've found definite pros and cons to using head-mounted lighting. So far I've tried it on two night outings: the first was a 20km ride that was about half through city, and half along a spooky river-side path of oft-changing quality, and the second was the aforementioned visit to the dark park where I took the photos above, and then the subsequent ride home through the city. You control where the light shines. Want to see something off to the side or further afield or closer in front? Just point your head where you want it. Huge benefit that trumps all cons. Can move your head side to side slightly to create movement in shadows that helps decipher the 3D nature of the scene, such as rocks and ruts in the path. Stays with you while off the bike. Controls, being at the front of your head, are always easy to find. The source of light next to your eyes can exacerbate the hazy effect of fog, and bugs that happen to be flying by that are suddenly illuminated inches in front of your eye can scare the bejesus out of you. While stopped at a traffic light, or other time you're not actively using the light to see, you have to take care not to absentmindedly shine it in people's faces as you wait. The light source near your eyes creates a mostly shadow-less view, which makes it more difficult to gauge the 3D nature of the scene (though as noted above a slight swaying of the head can remedy that). Probably looks silly unless you're climbing out of a cave. The relatively-low 120-lumen power mode is more than enough for walking or jogging, but for the higher speeds of cycling you need to be able to see further ahead in time, which means seeing further ahead in distance, so the brighter the better. 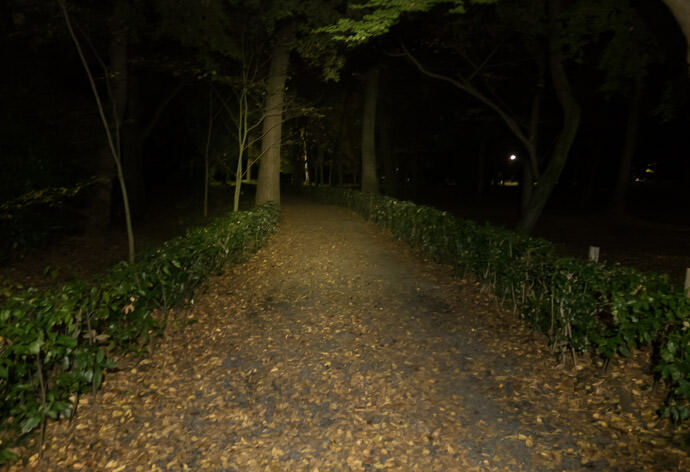 Riding along the dark riverside path from Osaka, which sometimes is really nice pavement and other times pockmarked mud, I felt fine doing 30kph (20mph) with the light at full 860-lumen power. 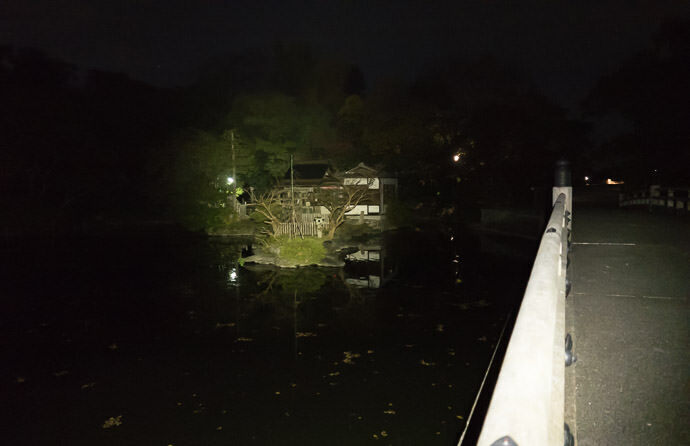 The temple building and trees in the last example are about 45m~50m away (150' ~ 165' away), which is almost six seconds away at 30kph. Back to my experience on the riverside path, I could use the lower power modes when the pavement was better, but I didn't feel comfortable to go 30kph... I needed to be able to inspect the road surface clearly as I went, and for this I wanted the brightest light possible. They don't specify what capacity battery was used to come up with these numbers. As I noted earlier, I found a huge range in battery capacities (1500 mAh to 4000 mAh), so I'd expect the same range in how long one can use the light. I wish they'd have mentioned the battery capacity that the claimed battery life applies to. 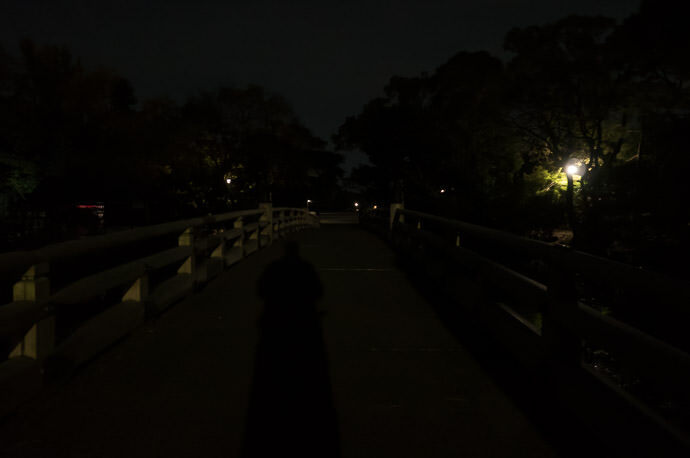 I don't ride much at night except for short jaunts around the city, and as such I usually don't need lights to see, but instead to be seen, so for normal cycling day or night I use bike-mounted lights on both the front and rear. On the front I use a Knog “Blinder” front 4-LED square, and on the rear a Knog “Blinder” rear 4-LED strip. 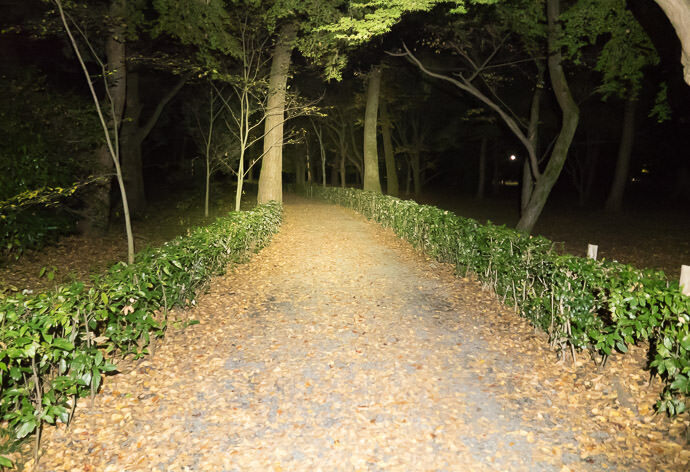 These are extremely bright from the “be seen” point of view, but provide almost nothing in the way of path illumination. A nice feature of these Knog Blinders is that they're rechargeable, and recharge via a normal USB plug. That means that I can recharge them on very long rides via the small backup battery that I use to recharge my phone on the go. They last a long time on one charge, so I don't often need to recharge them on the go, but it's comforting to know I won't be stuck in a long tunnel without a tail light. I also have a Pedallon LED 100-Lumen Rear Bike Light that I bought over the summer for $18 (now on sale at Amazon for $13, or the physically same product at GearBest for $10). It's very bright (in the “to be seen” sense), but I found the controls a bit over complicated, and the battery didn't last as long as the (twice-the-price) Knog Blinder. I tend to take long rides, so I prefer the Knogs. Speaking of controls, the controls for the this Skilhunt H02R flashlight are simple and easy to remember. It has one button. When you press to turn it on, a short click turns it on to the power level it was last at, while a half-second press turns it on to the dimmest 5-lumen mode, which is really convenient when you want to make sure you don't blind yourself when turning it on to look at a map. Turning it on via a double-click on the button puts it immediately into turbo mode. Double-clicking while it's on puts it into a seizure-inducing turbo-flash mode. A half-second press turns it off. A normal click while it's on, of course, cycles through the power levels. In addition to being astounded at the brightness of a modern flashlight, I was also amazed at modern reflective material. These days lots of running clothes come with little design flourishes of reflective material... perhaps just a few squares the size of a fingernail arranged in some kind of decorative pattern. I thought these were marketing hype, with little value for safety, but I was very wrong. 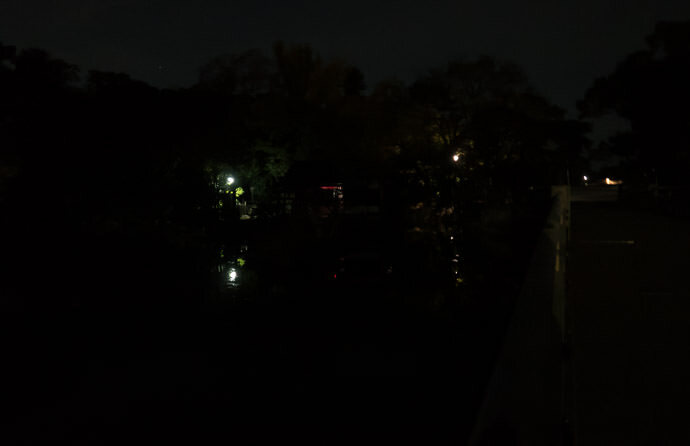 While riding down the dark riverside path, folks wearing clothes with these little fingernail-sized patches of reflective material were visible from very far away, and with the movement of their body highlighting their presence even more. Tiny fragments of reflective piping in the shoes, or a small tag on a sleeve, etc., were impossible to not notice 20 or 30 seconds ahead of time. It was astounding. 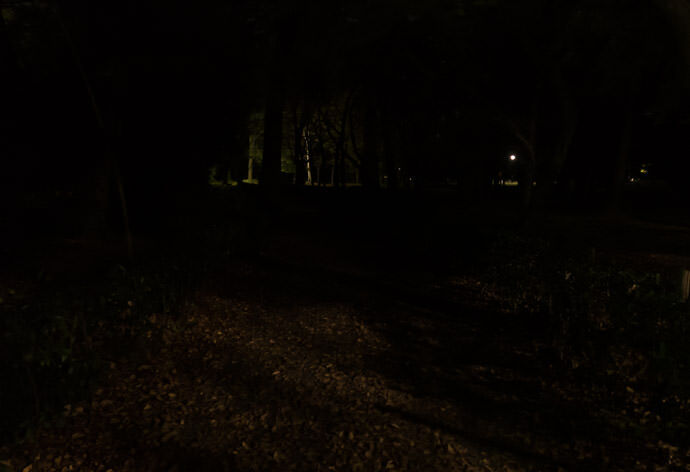 Most folks out running in the dark had at least something reflective on them, but some folks, notably elderly folks out for a walk, were generally wearing black and were invisible until bathed in the direct illumination of the flashlight. From now on, I'll put much more stock in reflective flourishes when shopping for clothes and gear. All in all it's a great flashlight with a size/price/brightness combination that I find to be amazing. If I lose it, I would spend my own money to buy another. Generally when buying rechargeables of this type you want to buy ones with protection circuits for at least temperature, but also charging rate. As Boeing learned with their 787s, they can generate a lot of heat and even catch fire. However they were using a lithium cobalt (LiCo) chemistry, which trades off thermal stability for more energy density; chemistries like iron phosphate (LiFePO4) focus more stability/safety while giving up some energy density (which is why they’re becoming very popular in the marine/boating industry, replacing the much heavier lead-based stuff). It’s been a while since I did any kind of research of flashlights and rechargeables, but the folks at candlepowerforums.com (the proverbial Mecca for flashlight stuff online), were often recommending not to use them for ‘amateurs’. But that was a few years ago, and I’m sure there has been a lot of knowledge and best practices developed since then. Just something to be mindful of for. As of now (2015) rechargeable li-ion may still be a developing field for “consumer” use. The keywords you probably want to look for are “protected” or “protection circuit”, as this helps to cut the circuit when temperatures or charge rates get too high. I live in Norway, at a latitude of about 60ºN, and ride to work every day. With the short days we have in Winter, living with darkness is a necessity. Absolutely everyone walking in the street in the dark carries a reflective patch of some sort: often arm or leg bands, sometimes a reflector strapped to a backpack or handbag. The city council gives free reflective vests to all kids every year. We are even starting to see a new trend in fabrics, with all-reflector jackets of seemingly normal softshell or waterproof finish. In my bike I have a ~500 lumen light, bike mounted. I’ve always found head-mounted lights to be an annoyance when wearing a helmet, not to mention with a balaclava/beanie on and eventually ski goggles. Also at 500 lumen anytime you gaze at someone it becomes very conspicuous. For city usage I think 400 lumen is probably the limit — higher than that and it could be blinding for cars if it is pointed up. At the back I have a couple of normal red blinking lights. One with Li batteries (non-rechargeable) is used as an emergency backup in case the main light (with AAA rechargeables) gets out of juice. I find that some of the rear lights you mention (80-100 lumen) to be perhaps too strong. You want to be seen, not blind the cars out of annoyance. On that note, I don’t understand why manufacturers keep making several hundred lumen lights with a blinking mode (and people keep using them!). In my small town, as a car driver during low/no light conditions when I sometimes (sadly) see cyclists (and pedestrians) wearing reflective materials and/or having decent lights to be seen easily & early, I want to pull over & thank them personally (& possibly take a photo with them). I have not done so but the desire becomes real strong sometimes.